. : Fall Pursuit! :: Ski XCOttawa.ca :: Skiing in Ottawa and Gatineau Park :. A common question for competitive skiers in the snow-less off season is "how do I make sure I am ready for competition once the season gets started?". From a physiological standpoint many coaches and athletes would start to answer this question by emphasizing the importance of training program that includes long slow distance coupled with interval (intensity) training and a comprehensive strength regime. 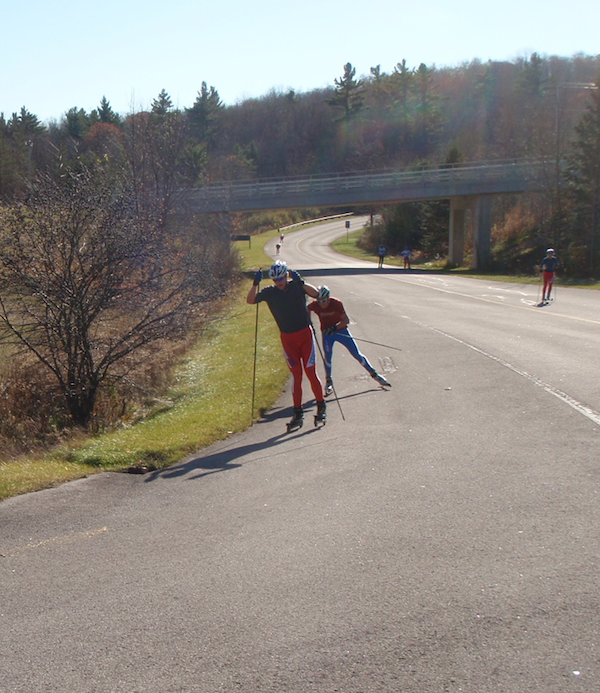 At a certain point though in the fall it makes sense to just get out there and do a race that best represents the challenges, both mental and physical, of the coming winter's ski races. So part of the answer lies in what one might call "race simulation", done on rollerskis, it is as close to a ski race as possible but requires no snow, little organization, and there are no special points or prizes for the winners. 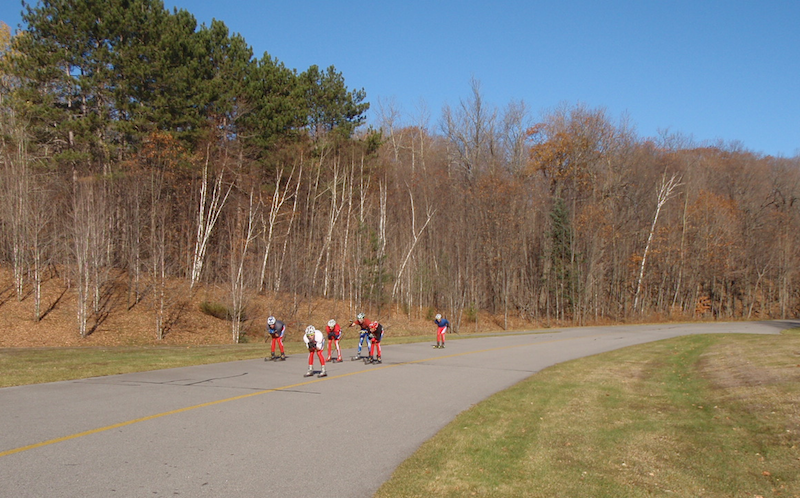 Last Sunday the team did a mass start, relatively long distance, rollerski time trial pursuit race (starting classic then transitioning to skate) on a challenging course on the Gatineau park parkway. The women raced 15km going out from P5 to just before Pinks Lake once classic then again skate while the men raced 25km going out from P5 to Lac Mulvihill in both techniques as well. Some of our colleges from other clubs, and indeed some of the members of our own team, were a little surprised at the length of the time trial. Why does it need to be so long? Partially it is to mimic the pursuit race at world junior and U23 trials to be held in Whistler in January. Pacing and being able to handle changes in pace takes practice and a longer race in both techniques practices this valuable race skill. 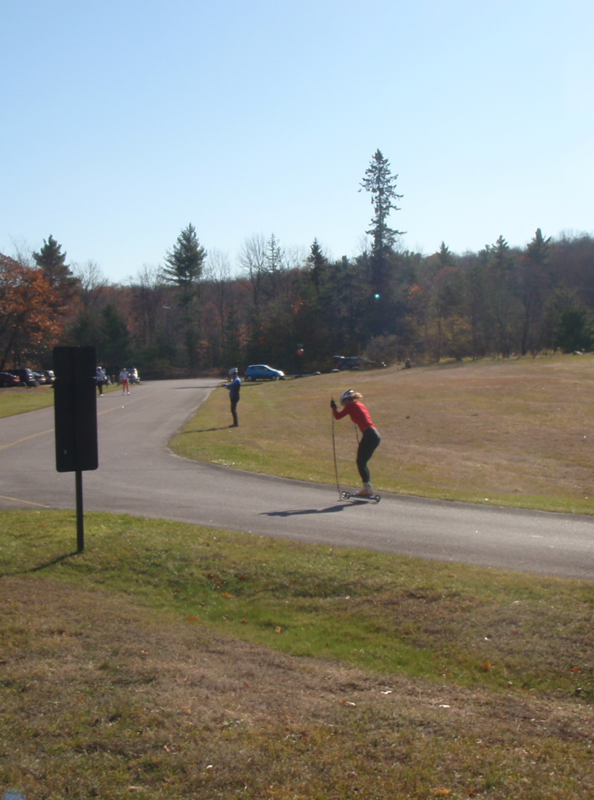 Second it forces you to really settle into classic technique before transitioning to skate, giving the experience of feeling pretty wobbly and uncoordinated on your skate skis as you pull out of the transition zone. Being ready for this and having practiced it is important! Every time you do a transition to skate technique with classic technique firmly "in your legs" you will get significantly better. Racing at the trials races in Thunder Bay last year I was certainly happy I had toughed out a similar long pursuit time trial and felt mentally ready for the race. This years simulation was longer and over hillier terrain so here's to being better prepared than ever! For me the fall pursuit is a staple part of my training program and everyone on the team enjoyed the race which also ended a big week of training in style. Congrats to everyone on a big effort and to Peter and Sheila with the wins and to Lee and Megan showing great form as the runners up. Hope you enjoy some photos of the event. Thanks to coach John Suuronen for putting on the race, timing, and taking a couple of photos in spare moments. Coach John Suuronen: "Yikes, Logan broke a pole on the skate lap." We feel for you man. Way to tough out about 9km of legs only! I also heard that Katie got a stone stuck in her boot which slowed down her normally fast transition a bit. 1. Sheila K. 25:45 22:30 48:34 19 secs. The men's pack starting out on a beautiful day. Ingrid sprinting hard to the finish. Lee breaking me at the finish. Great race buddy! 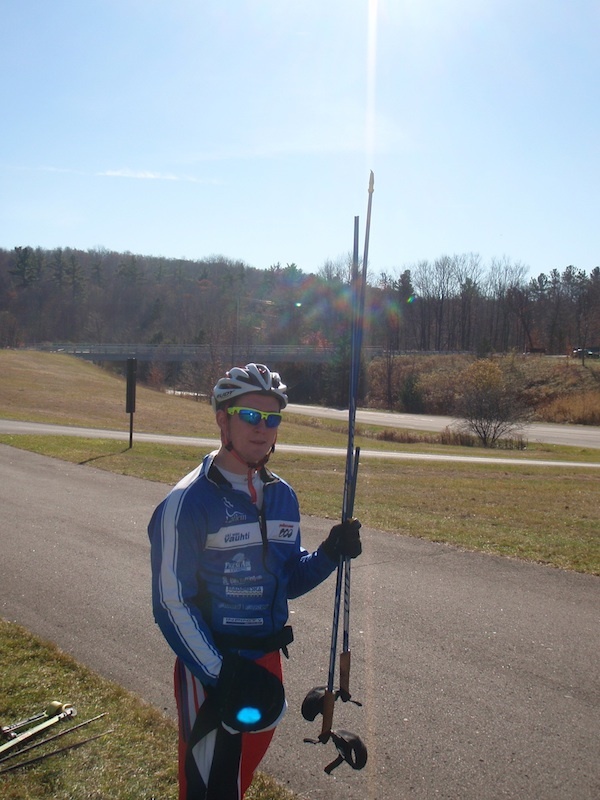 Logan showing off a broken pole at the finish. Tough luck! thanks for reading and hope you can get some "race simulation" in this fall. You'll be more ready for it! Training: A Feat of Great Stupidity! Training: The 8 day Week.